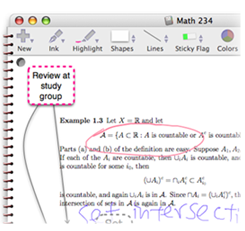 As you might imagine from its name, NoteBook For Mac is great for taking notes . If you're in a meeting or lecture, NoteBook's voice annotation feature guarantees you'll never miss a detail. Click the speaker icon next to any note to start playback from the point in the recording you began taking that note. Or send your voice annotations to your iTunes music library and from there to your iPod or iPhone, to review the recording while in the car. Words aren't always enough to capture an idea, so NoteBook lets you add diagrams, flow charts and sketches to any page. Build your diagrams using NoteBook's pre-built collection of shapes and line styles, or use your mouse or tablet stylus to sketch. If you're using a tablet, NoteBook varies the line thickness based on the pressure you apply to the stylus. It can even convert your tablet writing to text, using OS X's InkWell technology. You can even take notes right on top of your PDF class notes or lecture slides. When you drop the PDF on your Notebook and choose the annotate option, NoteBook adds each PDF page as a separate page in the Notebook. From there you can add text notes, create diagrams, circle important points, and generate a new PDF that includes all of your mark-up. Your PDF and mark-up stay organized within your school notebook. Qweas is providing links to NoteBook For Mac 3.0 as a courtesy, and makes no representations regarding NoteBook For Mac or any other applications or any information related thereto. Any questions, complaints or claims regarding this application NoteBook For Mac 3.0 must be directed to the appropriate software vendor. You may click the publisher link of NoteBook For Mac on the top of this page to get more details about the vendor.